The most engaging and active leadership roles are filling the role of a Chapter officer. This is an opportunity to develop hands on experience in communication, project planning & execution, team building, and time management. Elections occur once per year, typically in early spring. Click here to read a brief description of each officer position. Serving & Socializing SAL chapters have enjoyed the spirit of the fall season this school year. 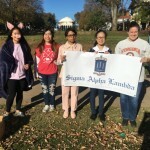 In addition to the Food Fight Against Hunger, members have decorated cards for kids, hosted fun social events and volunteered at fun Halloween activities.